The Utah Museum of Fine Arts at the University of Utah examines the uses of language in art throughout the centuries in its [con]text, an exhibit more than a year in the making, says Whitney Tassie, UMFA's curator of modern and contemporary art. The exhibit is divided into five thematic sections that look closely at how artists use text in art to communicate, to relate, to entice, to advocate and to illuminate—uses that have changed dramatically over time, Tassie says. 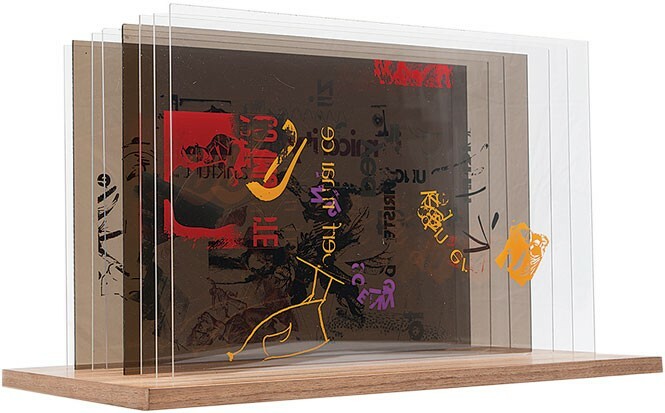 "While the intricate embellishments of medieval illuminated manuscripts made biblical text more accessible, more contemporary artists have paired powerful images with text to reclaim racial slurs," she says. To find pieces for [con]text, Tassie and the other curatorial staff pored through the museum's diverse collection—stone to ceramic, wood to papyrus, photographic paper to canvas to book art. Mounting an exhibit that pulls from such a broad cross-section of UMFA's collection presented challenges—and opportunities. "About half of our collection is works on paper, which are sensitive to light [and] have extremely limited allotments of exhibition time," Tassie says. "This exhibition has given us a chance to mine the collection." Many of the objects have never been on view before. The oldest piece is an Egyptian Wall Relief from 2494–2345 B.C. ; the newest is a photograph by Shannon Ebner from 2004. "The exhibition showcases the breadth of our collection—in terms of time period, culture and media," Tassie says. "It also shows the strength of our works on paper collection." Given its sheer range, the show is full of surprises. "Most exhibitions about language and text tend to focus on modern and later work, or even just especially on conceptual art," Tassie says. "This deep look at how artists and cultures incorporate language and text into their art is rare. The exhibition provides entry points for every viewer and creates wonderful comparisons, which we hope will inspire new understandings of how we experience the image/text relationship." In addition to bringing some lesser-seen works into the light of day, [con]text provides a magnificent opportunity to see the works of renowned artists like Robert Smithson, Robert Rauschenberg, Toulouse-Lautrec, Bruce Nauman, Robert Motherwell, Salvador Dali, Edward Ruscha, local painter Anna Campbell Bliss and a soup can painting by Andy Warhol. A work by John Cage—"Not Wanting to Say Anything about Marcel" (1969)—even uses language to say something about silence. "Cage builds a complex system of chance to break down language's primary purpose of communicating meaning," Tassie says. "His deconstruction of text calls our attention to the power of symbols, a concept text is based upon. In trying to avoid meaning, he highlights the often unseen, and perhaps nonsensical, structure of text." The use of text in art evolved in tandem with the evolution of language itself, as [con]text shows. "Since the advent of writing, artists have perceived and exploited the power of the written word," Tassie says. "Pairing text with images was a natural evolution. Some writing systems, such as Chinese, began as images themselves and evolved over the centuries into the abstract characters seen today. One of the longest-lived writing systems, ancient Egyptian hieroglyphics, changed very little over 3,000 years." Language continued to modernize through the Middle Ages with the invention of the printing press, which brought "text and image from the few to the many," Tassie says. "Artists discovered new freedoms and opportunities to experiment with the written word." This UMFA exhibition is a brilliant curatorial conception. It places such a wide array of art about language in the context of a historical overview, but also in the context of UMFA's astounding collection, and leads viewers to a greater appreciation of both. "There actually isn't another [exhibit] like it—with deep holdings covering 5,000 years of human creative history all over the globe—for hundreds of miles," Tassie says. "The collection allows us to draw really rich connections between the local and the global as well as the past, present and future."